For nearly 45 years, Roger Ebert has remained one of world’s most influential film critics. Beginning his career as a 15-year-old sports writer with the Champaign-Urbana News-Gazette, he joined the staff of the Chicago Sun-Times in 1966 and was named the paper’s film critic within six months. His byline has appeared in the paper ever since. In the intervening decades, he has won the Pulitzer Prize and served as the host of a nationally-syndicated weekly TV program, in which he and Gene Siskel would assign films their trademarked thumbs-up, or thumbs-down judgments. In 1999, he also launched the “Overlooked Film Festival” in his hometown of Champaign-Urbana, Illinois, featuring films that never received the reception he believes they deserved. Ebert has referred to the event as “the best train set a boy could ever want.” The 11th edition of “Ebertfest” kicks off Wednesday at the historic Virginia Theater in downtown Champaign, and will screen a dozen titles including Guy Maddin’s My Winnipeg, Ramin Bahrani’s Chop Shop and Courtney Hunt’s Frozen River, which took home the top prize at the 2008 Sundance Film Festival. 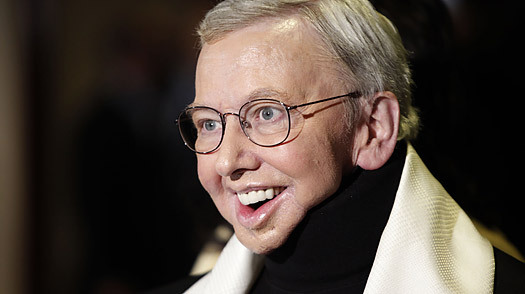 After a long bout with thyroid cancer and complications that left him unable to speak, Ebert made his first public appearance in nearly a year at the 2007 Ebertfest. “We spend too much time hiding illness,” he wrote in a press release, issued just prior to the fest. “There is an assumption that I must always look the same. I hope to look better than I look now. But I’m not going to miss my Festival.” TIME interviewed Ebert via e-mail. It’s no longer officially called the Overlooked, but Ebertfest. Some filmmakers demurred at having their films seem “prematurely overlooked.” This year, Begging Naked doesn’t yet have distribution. And the fest will be one of the few places to ever see a restored 70mm print of Baraka. Sita ran into a $250,000 royalty bill for the circa-1930 recording that supplied the blues. Now some sort of deal has been arranged, and it will open at the Gene Siskel Film Center in Chicago after the festival. Nothing could have been a box office success, I believe, but its distributor went belly-up in the economic downturn. It will be released on DVD in later April. Because multiplexes shut out foreign, art and documentary films. They cannot find screens in some cities or even some states. Because it is so costly to “open” a film. And because theaters don’t allow them time to build an audience. The filmmakers get them made, but can’t get them to audiences. With their focus on films aimed at the 18-25 demographic, the big exhibition chains are alienating older filmgoers and failed to grow and diversify their audiences. Many adults can’t find anything they want to see at a multiplex. Well, I love silent films. The Alloy Orchestra of Cambridge, Mass. performs all over the country with their own scores for silent films. I first heard them at the Telluride Festival. This year they’re appearing with [Josef] von Sternberg’s The Last Command , starring Emil Jannings as a general from Czarist Russia who loses his rank and everything else.